Two years ago I had the opportunity to spend a lovely few days in Victoria, British Columbia. If there's a more civilised city on this Earth I don't know what that city is. Victoria has a Scottish pub, an award winning bookshop that was established by a Nobel Laureate, the BC parliament and just about the most beautiful place in the world to walk your dog along the cliffs over the Strait of Juan de Fuca (views to Olympic National Park in the United States, Mt Baker and the San Juan Islands). If you get the chance to go to Victoria, BC take it. We arrived via fast ferry from Seattle and that's a great way to get there going up Puget Sound spotting dolphins and orcas along the way. I've wanted to learn more about Victoria for a couple of years now so I was excited to learn about a mystery novel set there in the city's formative years by Sean Haldane called The Devil's Making. Sean, you'll remember, was up for the Oxford Professor of poetry job that went to Simon Armitage in controversial circumstances. Sean grew up in Belfast, lived in Canada and now lives in London. (the great Irish novelist Brian Moore had a very similar trajectory.) Sean's poetry is extraordinary (take a look at some of his new stuff in English and Irish) and his brother lives on Manse Road in Ballycarry a road I must have cycled down 1000 times which is very close to the place where James Orr the famous "Bard of Ballycarry" lived. Ok that's enough plot. I loved the book and found it to be a gripping, philosophically rich, historical adventure. I also dug the period setting, the landscape, the clash of cultures and the crackpot characters. It reminded me a bit of my own book The Sun Is God which also deals with a bunch of lunatics on an island at the end of the Victorian era. This period is clearly ripe for this kind of fiction and Sean loves exploring this world as much as I do. If you're one of the many people who gave up 1/3 of the way in to The Luminaries then you should try this one instead. Or indeed if you're one of the people who finished The Luminaries you should still give this a go. 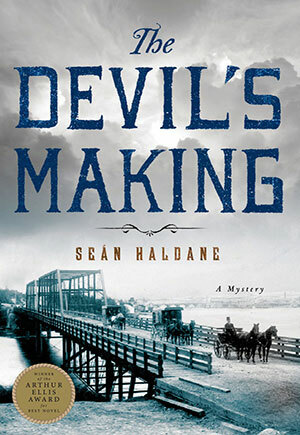 The Devil's making is a very nice blend of Caleb Carr, Brian Moore and Patrick O'Brian with sympathetic characters in a fascinating setting. I hope Sean continues to write more in a similar vein.